During 2015, a record 1.3 million refugees crossed into Europe. Between 2015 and 2016, more than 2.5 million people applied for asylum in the EU. By the end of 2016, authorities in the member states issued 593000 first instance asylum decisions. In 2015, Sweden received 162877 asylum applications, a 300% increase since 2013. Due to the amount of incoming asylum application requests, the Swedish Migration Agency has seen an unprecedented growth in the processing and handling times. The increase of people seeking refuge in Europe has caused strains on local societies and government authorities alike, prolonging the waiting times for residence permits and asylum. Shortening asylum seekers’ waiting time and ensuring that the time spent waiting is well utilized are currently the two most pressing concerns for local, national and European government agencies alike. 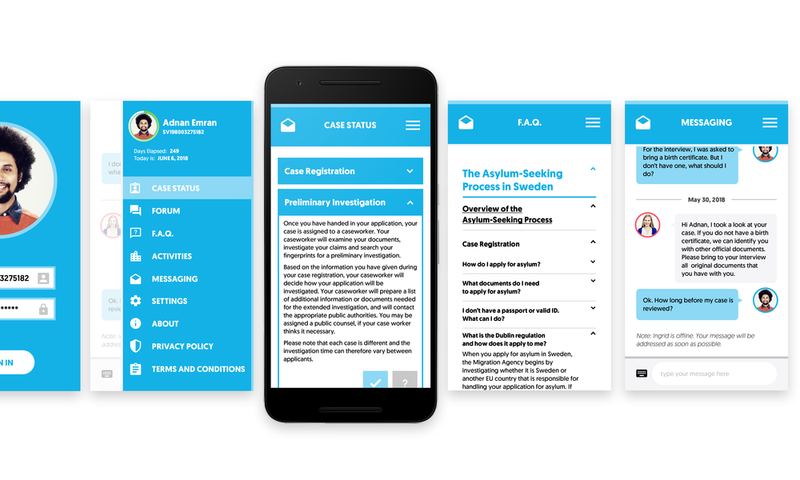 a digital platform that allows asylum seekers (users) to navigate their own asylum seeking application process, by providing them with secure individual access to their case status on mobile and desktop. a physical card that allows asylum seekers and refugees to access early-inclusion activities and existing public services, such as transportation, language and skill-based courses, cultural and networking events, to experience communal living. lack of mobility (leaving/returning to the refugee home). long application handling times, due to limitation in staff. support from the local community to invest on support for asylum seekers and refugees due to taxing and costs concerns. 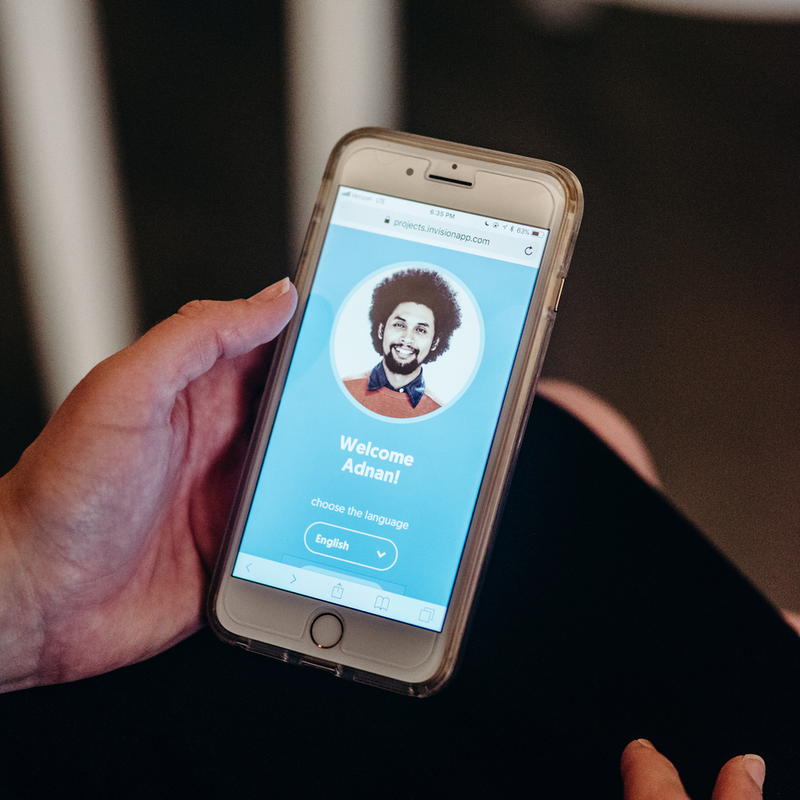 Born from a human-centered design process that involved all stakeholders in the administration of welcoming in Stockholm (Sweden), The Welcome Card has set three systemic goals to be implemented. providing access to public transportation. promoting fast and direct communication between asylum applicants and case workers. expanding and simplifying the F.A.Q. section. eliminating conflict and promoting resolution in the decision-making process. To foster collaboration between the Swedish Migration Agency and local governments to cultivate prosperity for the local hosting and refugee settling communities. encouraging public spaces to become moments for social interaction and peer-to-peer engagement. providing them with resources about Swedish law, workforce skills, social etiquette, culture and traditions. Step 1: upon arrival in Sweden, asylum seekers place a request for asylum and get registered with the national migration agency. Registered asylum seekers receive one Welcome Card per individual (based on age) to be used during the asylum application process, as both an identification card and as a key to their case status. Step 2: using RFID technology, the card is unique and personalized for the user. It can be carried by its owner to be utilized for communal activities and publicly available services in the area where they reside. Step 3: when tapping the Welcome Card on an RFID chip reader, or by using the log in credentials, asylum seekers can access their individual asylum application case status online or on a smart device. Step 4: with direct access to their case status and updated information at their fingertips, asylum seekers and refugees can now access communal activities as part of the public services available in their area. 1.3 million refugees: the growing numbers of asylum seekers arriving in Europe, mainly crossing the Mediterranean Sea, through Turkey, Greece, Italy and the Balkan region, sparked a debate regarding if and how European countries should sustain this influx of people. Over 75% of those arriving in Europe had fled conflict and persecution in Syria (378,000), Afghanistan (193,000) and Iraq (127,000). Pew Research Center, Key facts about the world’s refugee. 593000 first instance asylum decisions: the growing numbers of asylum seekers arriving in Europe, mainly crossing the Mediterranean Sea, through Turkey, Greece, Italy and the Balkan region, sparked a debate regarding if and how European countries should sustain this influx of people. Over 75% of those arriving in Europe had fled conflict and persecution in Syria (378,000), Afghanistan (193,000) and Iraq (127,000). 162877 asylum applications: in 2015, Sweden received the highest number of asylum requests, totalling 162877. Of this number, 35369 applications were filed by unaccompanied minors. The top three nationalities applying for asylum in Sweden were Syrian, Afghan and Iraqi. The Swedish Migration Agency, Applications for Asylum Received. Rubrik Inkomna Ansökningar om Asyl, Migrationsverket, 2015. Full document can be viewed here. 300% increase since 2013: the total number of asylum applications by the end of 2013 was 54259. 12-21 months: although varying by state, the handling time for registering and deciding upon asylum applications in most European countries far exceeds the 6-month limit. As of 2017, asylum seekers in Sweden face an average waiting time of 471 days, varying by citizenship. The top three asylum seeking nationalities in Sweden are Syrian, Afghan and Iraqi. The Swedish Migration Agency, Applications for Asylum Received. Rubrik Inkomna Ansökningar om Asyl, Migrationsverket, 2017. Full document can be viewed here. The Welcome Card is a project by Swedish design studio Sprig Design EF.